Eve Motion is a smart device for home automation from Elgato, compatible with Apple HomeKit platform. 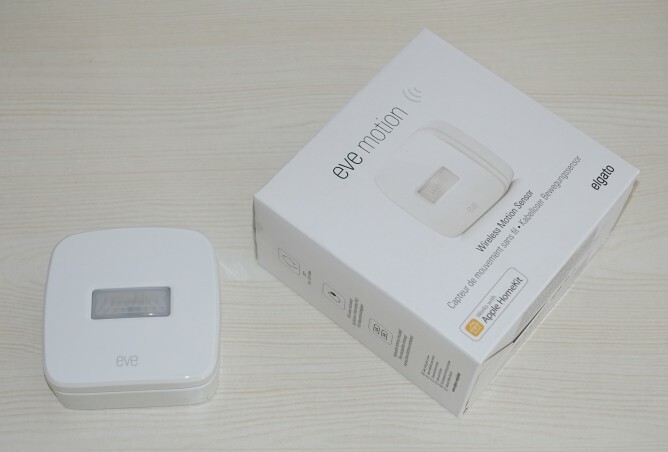 As the name suggests, Eve Motion is a motion sensor that would act as a trigger for other smart devices. Using Apple’s HomeKit, we can create custom rules that will turn this switch on or off depending on time, the presence of certain phones and other triggers from other HomeKit-compatible devices. Initial setup of Eve Motion is quite easy. First step is to add the device into our HomeKit by scanning the code available on the device itself. We can scan the code from HomeKit app in our iPhone, or from Eve for HomeKit app available for free from the AppStore. Using Eve’s app gives us more information on Eve devices compared to Apple’s native HomeKit app. As a nice bonus, Eve’s app also allows us to control all HomeKit-compatible devices, not just limited from Eve brand. User can set the sensitivity level of motion detection. I set mine on Medium and it’s working well so far. Another setting is to choose the duration of one trigger. We can set motion trigger duration from 5 seconds to 15 hours. For example, if we set the duration to 10 hours, it means once it detects any movement, it will record the next 10 hours as movement still occurs. I can see how this makes sense for a few seconds to a few minutes. I fail to imagine a scenario where I would like one movement to be considered for 15 hours. I use Eve Motion to trigger Eve Energy switch that I bought earlier. Automation feature from HomeKit allows us to create wide range of rules between HomeKit devices. For this one, I set a rule to turn on Eve Energy’s switch when motion is detected, then turn it off after 30 minutes, unless another motion is triggered before that. I can also set the automation to happen from 1 hour before sunset to 1 hour after sunrise, which is quite handy because I use to light up my garage when I arrive home at night with my kids. Similar to Eve Energy, Eve Motion uses Bluetooth connection. For it to connect to the “smart” world, it needs to be within connection range of user’s iPhone or HomeKit Hub. By default, Apple TV and HomePod will act as HomeKit hub when connected to home WiFi. Optionally, we can set our iPad to act as HomeKit Hub from the Settings. When there is no other device available within its Bluetooth range, Eve Motion will continue to record detected movements internally. The historical data will be synced to the cloud next time it gets connected. This is a big differentiating factor from some other products of different brand. Some HomeKit-compatible motion sensor would only send its trigger data to HomeKit system when connection is available. If somehow it fails to find Bluetooth connection from HomeKit Hub or user’s iPhone, such historical data will be lost. Obviously, without a connection, Eve Motion (or any other smart device, really) will not be able to trigger HomeKit automation. Eve Motion is battery-operated. No need to worry about cabling or power source. It uses 2 standard AA batteries and promised to survive up to 12 months before we need to replace the batteries. Let’s see if that claim holds true in a year’s time. Overall, I think Eve Motion is a good sensor that does its work as expected. I am particularly happy that my planned Automation is working as I planned.